Decorative Oval Windows with Insulated Glass. 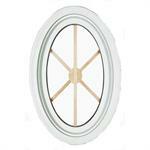 High quality crafted Decorative Oval Windows with insulated or single pane glass. Prime Wood or Prime Urethane on the exterior. Pine unfinished interiors. Many styles available. Rough Opening: 22"w x 34"h.
Rough Opening: 1'10"w x 2'10"h.
Wood Casing unfinished pine for interior of OVW1828 (22" X 34" Rough Opening) windows. Wood Casing unfinished pine for interior of OVW24310 (30" X 48" Rough Opening) windows. 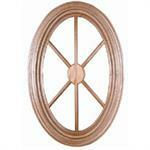 2" extension jamb for all Oval 30"x 48"windows. This item sold separately from the window.